New Eastman and Laird art for IDW 30th Anniversary TMNT cover! 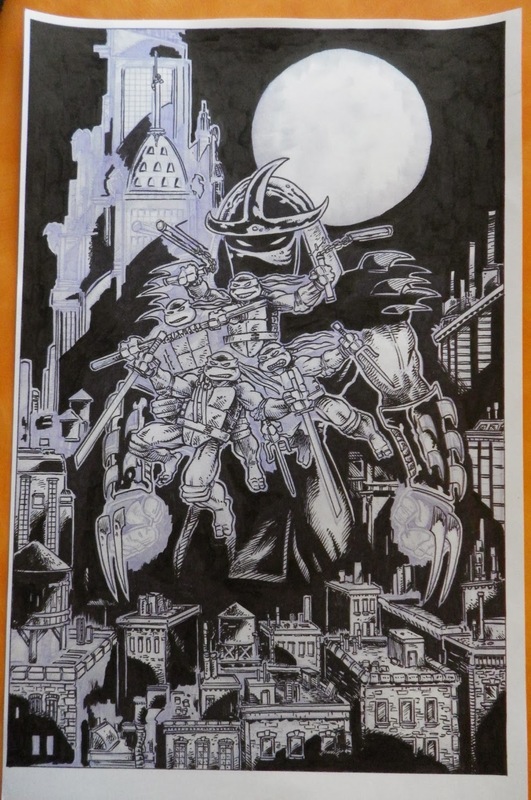 About a month ago, I got an intriguing request from Kevin Eastman. 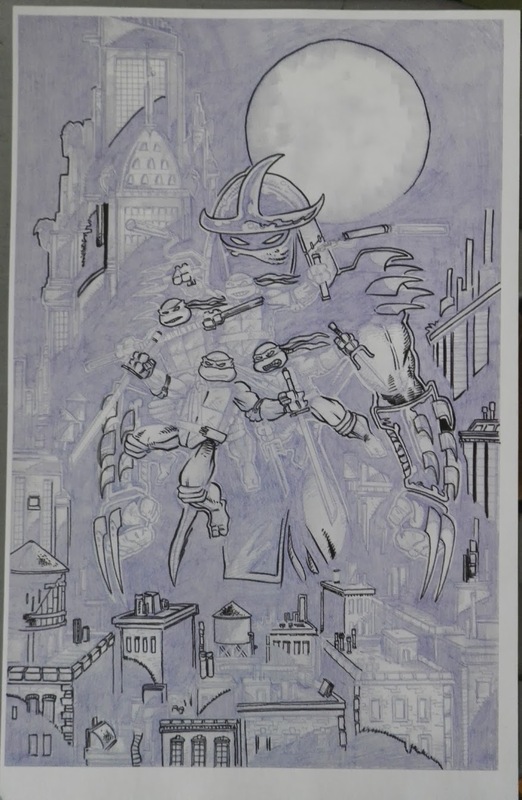 He was penciling a cover for another IDW TMNT-related comic book, this one a thirtieth anniversary special, and he wanted to know if I would like to ink it. … and when I saw the pencils, I knew I was right. 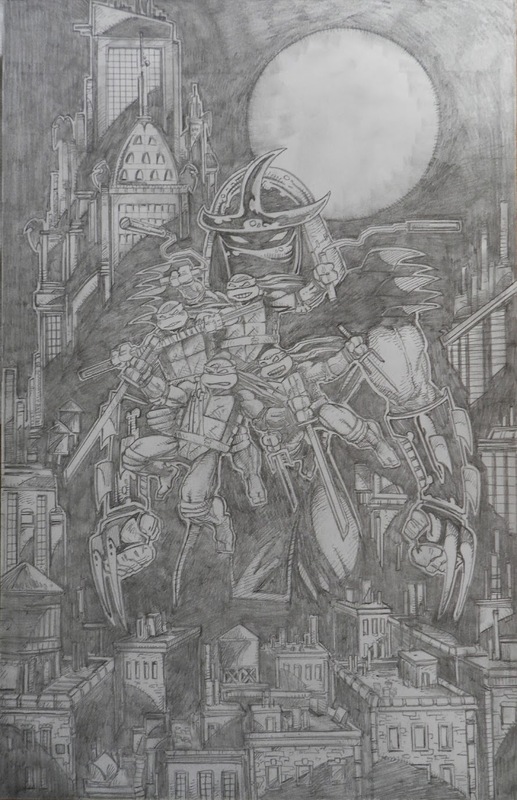 Kevin had crafted a beautiful, very tightly-penciled, montage-style image featuring a complicated cityscape and a bold group shot of the Turtles leaping into action, all dominated by the looming image of the Shredder. It was so tight, in tact, that I suggested to Kevin that it should just be used as is… but he wanted to see it inked, so I went ahead and got out my brush markers and set to work. 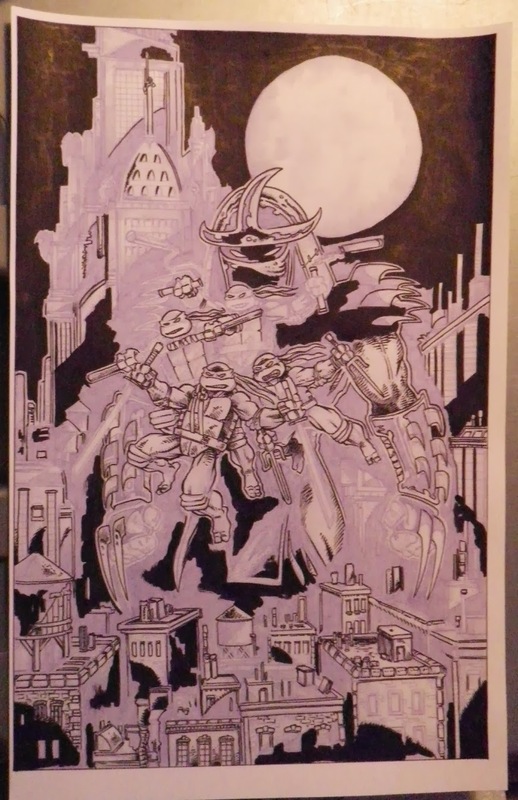 So I was faced with a small dilemma -- should I ink directly over the pencil drawing, thus losing forever its greyscale coolness, or should I somehow transfer the image to another piece of paper and ink it on that, preserving the original pencils? I opted for the latter, via a technique I'd used before. Employing the color laser copier at Mirage, I copied the image onto a sheet of 11" by 17" card stock, using the copier's ability to print a greyscale image in the color of my choice. I tried to pick a hue as close to "photo-blue" as possible (that being a shade of blue which is difficult for cameras -- or scanners -- to pick up). I made several copies in case I messed up and had to start over, and got to it. And as I did so, I realized what an unusual piece Kevin had created here, with its impressionistic shadows and suggestions of forms. It was a little daunting at first, trying to figure out exactly how to lay down the ink lines so as to best capture the effect Kevin had achieved. One other thing I did -- with Kevin's blessing -- was to make a couple of small detail corrections, things that the casual reader would probably not notice, but which stuck out to my eye. First was the placement of the blades on the Shredder's forearm gauntlets. 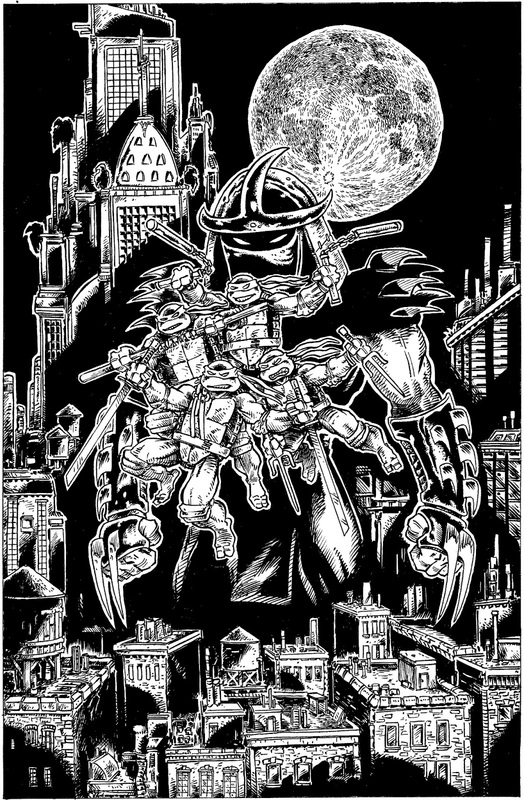 The way Kevin had drawn them here looked fine as far as this particular drawing went, but having worked on many an image of the Shredder in the comics we'd done together years ago, I could tell that this detail was not exactly the way we used to draw it. 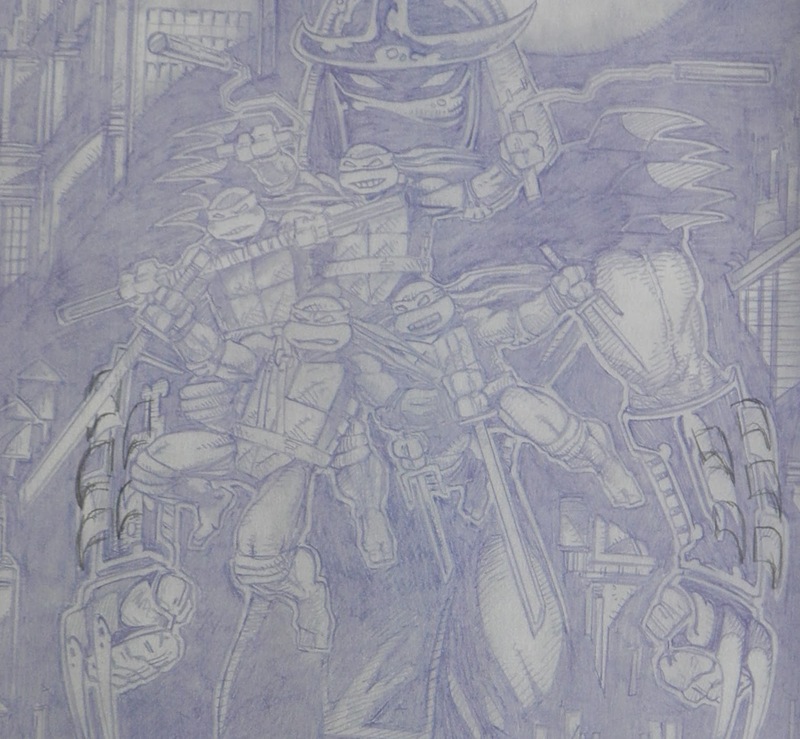 So I lightly penciled in the blades to look the way we had established in those old TMNT comics. The other thing was a stylistic bit that I almost inked as is, because in this drawing the gesture looked just fine. But my practical side just wouldn't let me go there. 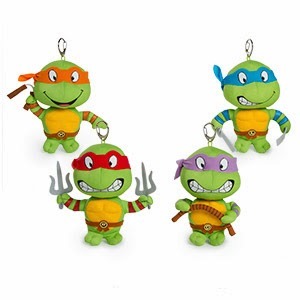 The detail in question is Michelangelo's nunchaku. Kevin had drawn them with a very dramatic flourish, but also with cords connecting the nunchakus sticks which looked way too long to me. So I shortened them up, and made them chains instead of cords (again, going back to the early days). Fortunately, none of these changes required major alterations to what Kevin had penciled, to my relief. It was a lot of work, a lot of fun, and took me about four days to finish (taking breaks along the way). Once I'd put the last bit of ink down, and the last little correction with a white-out pen, I brought it to Mirage to scan (the scanner there is better and faster than the one I have at home), and took the scanned file back home with me to clean it up, rotate it into proper orientation and get it ready to send to Kevin. I was pleased to see that the "blue line" approach had worked quite well, and I was able to clean up any stray remaining areas of blue with no problem, leaving a nice clean black and white image to be colored for the cover. This was only the second time that Kevin and I had worked on a piece together in many years, the last time being a few years back for the Jake Black benefit print. I hope we do it again, and soon. It was a blast! And it was especially gratifying that Kevin got a kick out of what I had done with his gorgeous pencil drawing.